The importance of gutter and downpipe maintenance. Why should you convert from electric to natural gas? Have you noticed dark stains on your ceiling? If so, it probably means your roof has sprung a leak. This is an unfortunate situation but is highly prevalent in south east Queensland, due to the amount of extreme weather conditions we experience. Although you probably only have a small leak, if left unnoticed or untreated, the leak can cause significant damage to your home or business. If you leave the leak for too long, the encroaching water can rot your beams, insulation and ceiling. Untreated roof leaks may also lead to mould and mildew issues. To avoid unnecessary costs and health concerns, here are STO Property Group’s helpful tips to consider when you suspect that you have a leak in your roof. 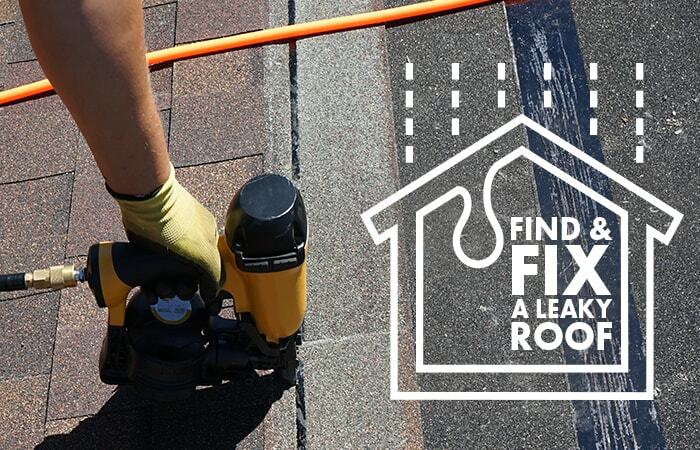 After noticing that you have a leak in your roof, the first step is to inspect the roof visually from the inside and then from the outside to attempt to identify the source. Identifying the leak can be the most difficult part of the process. But if you are lucky the leak may be caused by an easily identifiable source such as a cracked tile, or a gutter blocked with detritus. If you are unable to find the source of the leak, try looking around any ventilation components, air-conditioning units or skylights, as the seals may be broken or worn out. If you are unable to find the source of the leak, try using a hose on suspect areas and have a second person look at the ceiling from the inside while you are hosing to determine whether there is any leakage. You can also climb into the manhole with a torch, during or shortly after heavy rain, being careful not to step through the ceiling. Then examine the roof covering and beams in the roof above where the ceiling is wet or stained. You can follow any water stains or wet spots up the beams or roof covering to the highest point. This should help you to identify the source of the leak. After you have identified the source of the leak, your next step is to try to fix it. You can often do this yourself and it may only take a few minutes. There are many options available, however a good solution is to try applying co-polymer sealants. These products are extremely effective on tiles, steel, aluminium, and Colourbond. If you have found the leak, wipe the surface clean and put the sealant product in the caulking gun. Squeeze the sealant into the problem causing gap, hole or crack and scrape the excess away with a spatula. This is a fairly quick fix and is applicable in many roof leak instances. If the sealant option does not apply, depending on the cause of leak you can always try alternative options such as; purchasing replacement tiles and missing end caps or clearing out your gutters. If you are unable to identify or fix the leak on your own after following our brief tips outlined above, it may be time to call in the experts. STO Property Maintenance Group are experienced professionals and can identify and fix any leak you may have in your roof. Call us at STO Property Maintenance Group today to obtain expert advice, organise an inspection, or repair and maintain your roof. STO Property Maintenance Group offers many competitive roof maintenance and repair services and operate throughout the Gold Coast, Brisbane and Sunshine Coast areas. Call us today.